The debate over whether ‘human rights’ are indeed ‘universal’ or, as some would argue, are to be understood and applied differently depending on national, regional, cultural or religious contexts (so-called ‘cultural relativism’) is well-known. In today’s world, where political leaders in some established democracies appear to be sounding the retreat from liberal internationalism, and where religious extremists are bent on dividing the world into ‘us’ and ‘them,’ this debate takes on particular poignancy and importance. It is therefore important, at this time of global uncertainty, to try to objectively (and, if possible, scientifically) understand whether the contemporary world is indeed retreating into cultural relativism, or is, on the contrary, marching inexorably towards universality. State adherence and commitment to the international human rights treaties offers a useful measurement criterion, or indicator, that might allow such an objective or scientific assessment. Those treaties fulfil a central function in the global human rights system. By voluntarily acceding to them, States bind themselves into a comprehensive framework of human rights obligations. Then, working in dialogue and cooperation with the Treaty Bodies, States take steps over time to bring national laws, processes and practices into line with universal norms. Notwithstanding, when acceding to international human rights treaties, some States enter ‘reservations’ that limit, either generally or partially, the scope of application of the treaty in domestic law. So, for example, a State may make a general reservation to only accept obligations under a treaty insofar as those obligations are compatible with the tenets of a given religion; or may make a partial reservation to limit the application of a certain treaty article. These reservations have a significant negative impact on the on-the-ground enjoyment of human rights. If a State does not consider itself fully bound by a treaty to which it is Party, or does not consider itself bound by a certain article(s) of that treaty, then it is unlikely to take the necessary steps, at domestic level, to fully respect, protect or promote the right(s) in question. If a given treaty, or article within a treaty, is the subject of a large number of reservations, it is clearly suggestive of a perceived incompatibility between the rights concerned and the cultural norms or religious sensibilities of certain States. The presence of reservations, in other words, reinforces the arguments of cultural relativists; while the withdrawal of reservations, or the decision of a certain State to accede to a convention without reservations in the first place, is a powerful indicator of universality. 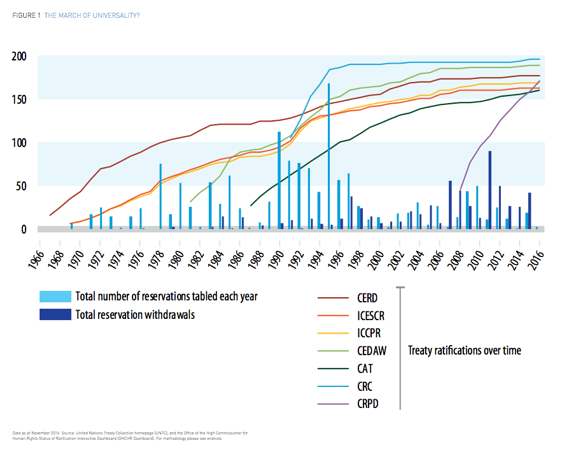 Between 2014-2016, the Universal Rights Group (URG) led a major international project to track levels of ratification of the core human rights treaties around the world, and to map all reservations to those treaties. Some of the top-line results can be seen in Figure 1 below. The final report of the project can be read here. URG’s analysis also found that States have even made progress in lifting ‘religion-based reservations’ – i.e. reservations that are, or appear to be, based on an understanding that certain universal norms are incompatible with religious belief or doctrine. That States are broadening the boundaries of universality, even across sensitive issues that touch on matters of religious belief or doctrine, is again a powerful and welcome sign that the international community is moving towards – not away from – a universalist understanding of and commitment to human rights. Feature photo: Amine GHRABI. Bardo, Tunisia. 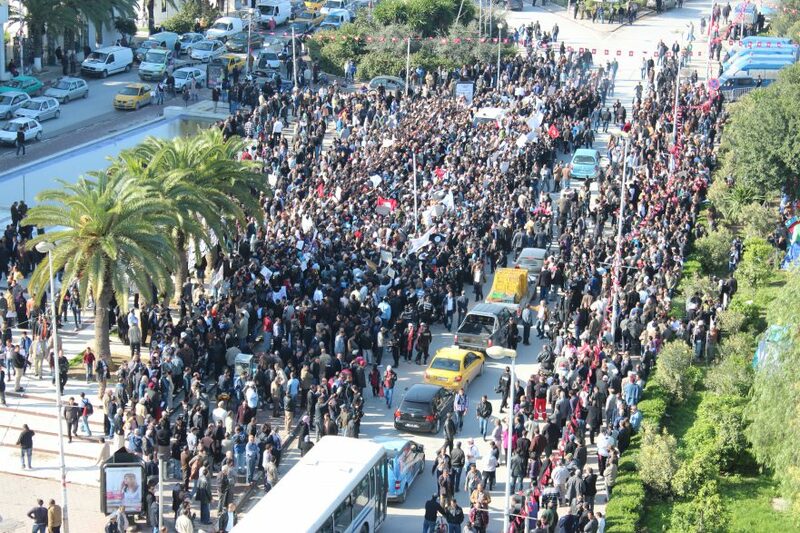 Third day of demonstrations in front of the national constituent assembly. 03/12/2011. Licensed under: CC BY-NC 2.0.